Elliot Jay Stocks is a designer, speaker, and author. He is currently the Creative Director of Adobe Typekit, co-founder of lifestyle magazine Lagom, founder of typography magazine 8 Faces, and an electronic musician. He found the time to talk to us about all of the above. Can you tell us a little bit about how you got to where you are today in your career? Sure. I always drew as a kid and for a long time I thought I’d become an illustrator, working in comics, mainly. But as I got older I got more and more into design, and when I eventually got a computer at age 17 (which was very late in the day at the time), I discovered I could use it to do design. I set up a small record label with some friends before I went to university and handled all of the CD packaging, the point of sale material, and the website — and that then got me into the web. I got heavily into Flash while I was at university, and by the time I left I had a small portfolio of music-related websites I’d made on a freelance basis. That enabled me to get a job as a Junior Web Designer at EMI Records, which meant I got to design sites — terrible, cheesy Flash sites — for some really big artists and bands. I spent a couple of years at EMI, started getting into Web Standards, and then joined another record label called Sanctuary. Their business was going down the pan and as a result I had a load of time to learn HTML and CSS properly, and work on the first proper version of my site. That did the rounds on the CSS galleries of the day and helped me get my name out there a bit. I then started writing for some magazines like Computer Arts and speaking at small events, which helped me get my name out even more. After about a year at Sanctuary, Ryan Carson contacted me and I joined Carsonified as their first designer. After a few months there, I left to become freelance. In 2010 I was getting tired of my web work being so ephemeral and wanted to make something that would last, so I decided to dip my toe in the world of print and launched the typography magazine 8 Faces. I had pretty much no idea what I was doing and I only made it for myself, really, but it turned out to be quite popular and sold out, so I was then committed to making more issues. That ran for eight issues and we printed our final one earlier this year. Throughout all of this time, I continued to speak at various events and write for other magazines. I also started a company with Keir Whitaker called Viewport Industries, which we ran until a few months ago. Under that banner, we put out various products and hosted a number of events. Doing 8 Faces and immersing myself in the world of type eventually led to Typekit getting in touch and I joined the team as their Creative Director in early 2013. 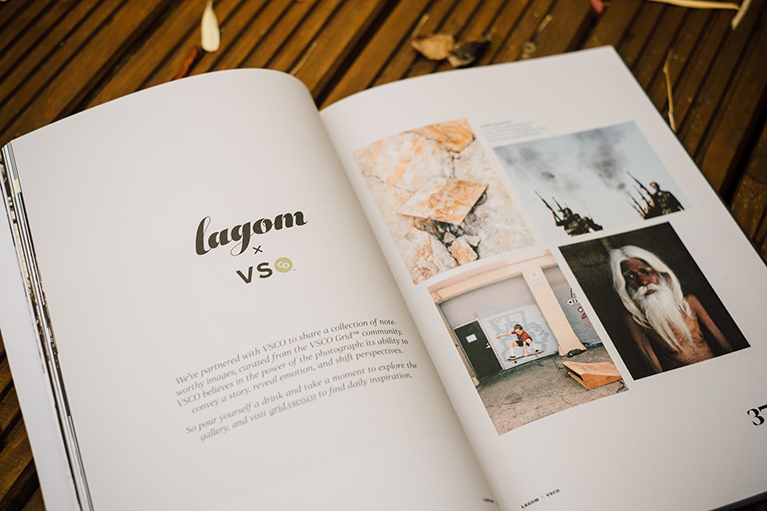 In September this year, my wife and I launched Lagom (http://www.readlagom.com/): a new lifestyle magazine celebrating creativity and innovation. It’s probably been the biggest side-project I’ve ever undertaken. As a wearer of many hats (creative director, magazine publisher, part-time musician), can you walk us through what a typical day entails for you? Most of my day is spent on Typekit work, which varies quite massively from being in lots of meetings, to co-ordinating design tasks, to looking after our integrations, to getting down and dirty with Photoshop and Sublime Text. Nights are usually dedicated to magazine-related tasks, which vary from planning with my wife, through to looking after the social media stuff, or high-level tasks like liaising with potential partners and stockists. It’s generally all pretty varied, and broken up with a nice long walk in the countryside with my dog at lunchtime. 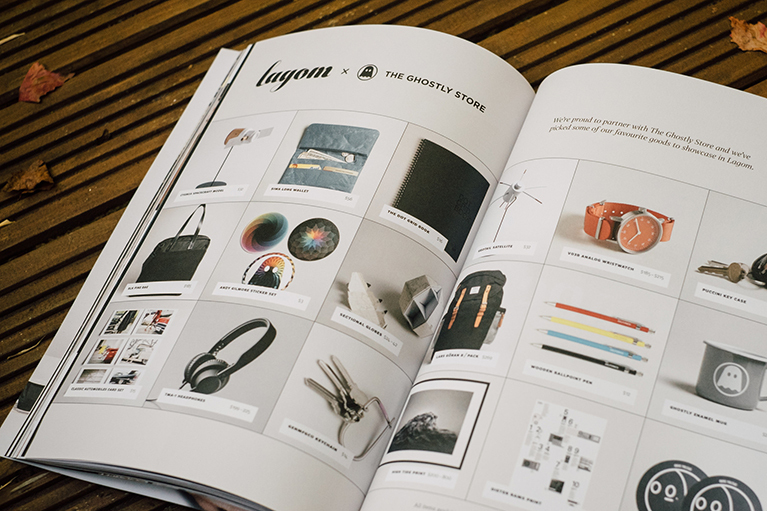 Above – Spreads from Lagom magazine. I’ve always been interested in the difference between creative generalists and specialists. In your mind, what is the advantage of one versus the other? Good question. I’ve often thought about this. I feel like it’s better to be a generalist; to be a jack of all trades and a master of none. Our industry is so diverse that it doesn’t feel wise to pigeon-hole yourself, especially as skills and roles come and go with great frequency. That said, it’s useful to be seen as an expert in some areas, so I feel like it’s useful to generalise but have at least some degree of speciality. Also, I’m biased because personally I find it hard to concentrate on one thing and I’d go mad if I had to commit myself to just web design, or just print design. Basically I have a very short attention span! What are some secret Elliot Jay Stocks™ brand productivity tips or hacks you employ in getting stuff done? If you were stranded on a desert island and only had one typeface you could use in all future web and print projects, what would it be? Just one? Man, choosing eight was hard enough! I’m going to cheat and choose the entire Tabac super-family, which is what we use to set Lagom. The serif has four grades (variations in contrast) which is so useful, and I love the slab serif, which has weights from Hair to Black. I’m always partial to slab serifs anyway, though. Fast forward twenty years. What is future Elliot Jay Stocks doing and working on? Haha! Good question. Hmmm, let me think. I’d be 53 then. I’m not very good at relaxing and I have this general feeling of unease if I’m not creating something, so I think I’ll always be making stuff right into old age. At 53, I would like to have ‘retired’ in the sense of not having to work anymore. If that’s not possible, then hopefully I will have at least retired from client work and just be focussing on making my own projects. I also have this kind of vague fantasy of getting serious about making music, so who knows? Maybe I’ll be looking back at a twenty-year music career by the time I’m 53! Haha!